Across the eight European countries studied, younger adults – those ages 18 to 29 – largely agree with those older than them that the news media are important to the functioning of society. But, when it comes to how the news media are doing, younger people in many countries are less keen on their performance than older adults (those 50 and older). Particularly in Spain, the UK, Denmark and Sweden, those under 30 are much less satisfied with how the news media are doing on reporting without bias or covering key issues. Across the eight countries studied, broad majorities of all age groups agree that the news media are important to the functioning of the country’s society. Only in three countries – Germany, France and Spain – do younger people rate the importance of the news media differently from those in the oldest age group. In Germany, younger adults are less likely to think the news media are important to society than older adults. There, 85% of Germans ages 18-29 say the news media are important – about the same rate as those 30-49 (89%) but lower than those 50 and older (93%). In France and Spain, the opposite is true; younger adults tend to see the news media as slightly more important. For example, in France, 84% of those under 30 say the news media are important, compared with 76% of those 30 to 49 and 73% of those 50 and older. Younger French adults are also more likely to say the news media are very important to society (37%) than those 50 and older (24%). 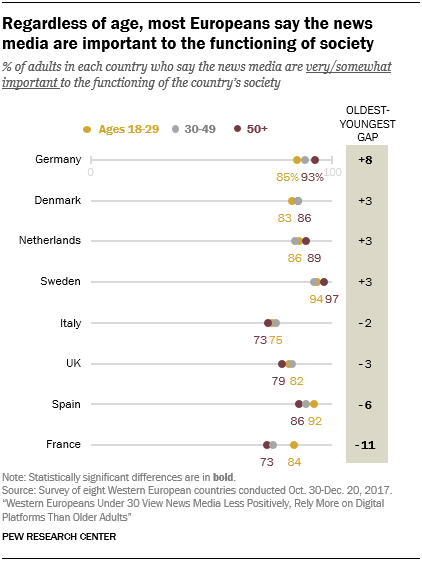 But, even while younger and older Europeans are in sync about the importance of the news media, younger adults stand out in some countries for the relatively low marks they give the news media’s performance. In four of the eight countries surveyed – Spain, the United Kingdom, Denmark and Sweden – younger people consistently hold more negative attitudes about the news media than the oldest age group. This is true when it comes to both how the news media perform across five key functions and how well they cover three key issues. Respondents were asked to rate how well the news media performs across five dimensions: covering all important stories of the day, investigating the actions of the government, getting the facts right, providing coverage independent of corporate influence and being politically neutral in their news coverage. In Spain, the UK and Sweden, adults under age 30 tend to think the news media are doing a worse job across at least four of these issue areas than do those ages 50 and older. Spain highlights this pattern most clearly. Spaniards under 30 are less likely than those ages 50 and older to give the news media high ratings. For example, 32% of younger Spaniards say the news media are doing a good job being politically neutral in their news coverage, compared with 43% of those ages 30-49 and 52% of those 50 and older. There are similar gaps between younger Spaniards and those 50 and older of at least nine percentage points when it comes to evaluations of how well the news media are doing at providing coverage independent of corporate influence, covering all important stories of the day, getting the facts right and investigating the actions of the government. Across all of these issue areas, the starkest age gaps emerge when it comes to how well the news media are doing at investigating the actions of the government. In the UK, for example, 35% of those ages 18-29 say the news media are doing a good job at this, compared with 53% of those ages 30-49 and 57% of those 50 and older. In both Denmark and Sweden, younger adults are 16 percentage points less likely to say the news media are doing a good job investigating the government than those 50 and older. People were also asked how good of a job they think news organizations are doing reporting on three key issues: immigration, crime and the economy. Once again, younger people in many countries say that the news media are doing a worse job reporting on these issues than those older than them. In France, for example, 53% of adults ages 18-29 think that the news media are doing a good job covering the issue of crime, compared with 64% of those 30-49 and 73% of those 50 and older. Across three countries, younger and older adults diverge in their assessments of how well the news media are reporting on all three of these issues. But, the differences in opinion between younger and older Europeans tend to be largest when it comes to how well the news media are doing reporting on the topic of immigration. In Demark, for example, about half of those under 30 (49%) say that the news media are doing a good job covering immigration, compared with around three-quarters of those 50 and older (74%).